^The Captain Marvel film is going to be set in the 90s, & she's gonna be fighting Skrulls. Thanos likely will not have even begun his quest for the Infinity Stones yet. At this point, we're not even sure what Avengers 4 is gonna be. The popular interpretation is that it's still gonna be "Infinity War pt 2" as originally intended, but that's not guaranteed. Attilan is destroyed, its population relocated to somewhere on Earth that has been kept secret from the audience for no discernable reason. Maximus is trapped in a bunker with enough food & water to keep his crazy self alive as long as his body can hold. Medusa did something nice for somebody who wasn't herself or a direct relation for once. Zombie Gorgon stops zombie-ing, just a few seconds too late for Declan to make it through the series alive. Karnak is racked with guilt for zombifying Gorgon. Bolt shows absolutely no character development whatsoever but actually manages to look sympathetic in the process, suggesting that if anybody had ever once come to him with a valid complaint about the caste system, he probably would've ended it long ago. Crystal finally stabilizes her accent just in time for the series to end. There's a little bit of a hook for another season, but screw that. Ironically, this was by far the best episode of the series! Just like how it took them 4 weeks after the IMAX premiere to make a halfway-decent trailer, it took them until the FINALE to make a halfway-decent show. At the halfway point & the end credits, there were teasers for season 5 of SHIELD; now that looks good. Here's a cool batch of character posters for Runaways: Alex, Nico, Karolina, & Gert, Chase, Molly. I also just found out that Hulu's gonna release just the first 3 episodes on November 21st, with the rest coming out weekly after that, so the whole season will be up by early-January. Contrast The Punisher, which will have its whole season out this Friday on Netflix! And season 5 of Agents of SHIELD starts December 1st on ABC! Also, I'm adding a totally-subjective quality tier ranking list to the OP. The other day I was watching Thor Ragnarok and said to my wife, "I really like Jeff Goldbloom. ...I hope he never raped anyone." Timeline is updated; all the chronological water-treading the movies are doing is giving Netflix time to catch up. I might need to hold off on watching Runaways until the new year so I can see it all within a free trial of Hulu. Does anybody know how long Hulu leaves up episodes of its original shows? In case you haven't heard, the first trailer for Infinity War went up today. The season 5 premiere of "Agents of SHIELD" is Friday. Episode 4 of "Runaways" came out yesterday. Lucy Liu directed the season 2 premiere of "Luke Cage". Guys. Disney is buying Fox Studios. (Not the entire Fox network, just the film division.) Feige is excited. Let's appreciate what that means: Marvel Studios will now have access to Fantastic Four and X-Men characters. Deadpool can joke about it. Hugh Jackman can get his wish of being in an MCU film. Let's appreciate something else, too: Most of the X-Men movies are already good, & mixing the X-Men with other Marvel plots rarely turns out that well in the comics. (IIRC, mutants canonically gave Civil War a metaphorical middle finger back in the day.) But the big thing here is that we might FINALLY get a GOOD Fantastic Four movie in MCU phase 4! Also, this arc of "SHIELD" is set in the future. I'll figure out how the timeline works once that plotline resolves. Also Galactus, & Marvel Studios won't turn him into a ****ing cloud. By the dubs, here's our first trailer for Jessica Jones S2, coming out in March! The Punisher has been renewed for a 2nd season, but don't expect it until at least mid-2019. SHIELD is powering ahead; they'll only be taking 1 week off for Christmas hiatus. This is a clip from Infinity War. Not a trailer (though it has part of the trailer we've already seen stapled onto it), just a straight-up clip. It's got the Guardians in it, & it might be kind of a spoiler if you're trying to avoid anything beyond just the official trailers. This Japanese "final" trailer for Black Panther is pretty tight too. While we don't have an actual release date yet, Freeform said that Cloak & Dagger will air on Thursdays (so it won't be up against Runaways [Tuesdays], SHIELD, Black Panther, or Jessica Jones [all Fridays]), & that "winter 2018" thing is still in effect, so that does narrow down the options. With SHIELD in motion, Runaways halfway through its season, Cloak & Dagger and Black Panther on deck, and Jessica Jones and Infinity War on the horizon, there's not gonna be another real resting point in the MCU until late May-early July (when Ant-Man & the Wasp comes out)....pending the release dates for Daredevil s3, Luke Cage s2, & New Warriors. the entire first season pretty much only addresses about half of the first arc of the comics. They are VERY lucky to have gotten renewed for a 2nd season yesterday. For real, though, I watched most of Runaways during SHIELD's Christmas break last week, & once again, I was overjoyed to have SHIELD back afterwards. (FYI, Agents of SHIELD is still awesome.) This wasn't the disaster that Inhumans was, but it was still a letdown. We are just over a month out from Black Panther! We're also just under 2 months from Jessica Jones s2! Still waiting for a premiere date on Cloak & Dagger, but it should be soonish. Marvel Studios has officially hired screenwriter Jac Schaeffer for a Black Widow solo film! As a reminder, Kevin Feige has stated as recently as last month that Marvel is expecting to start off a new 20-film arc once the MCU wraps up its original 22-film arc with Avengers 4 in 2019. Adding in Widow makes 13 films out of the 20. Feige is also vocally excited about getting to use the X-Men, but it is yet unknown whether they will enter MCU continuity or just keep on keepin' on in their already-successful-&-thriving series. We finally have a premiere date for Cloak & Dagger: June 7th. So much for the "early" 2018 that Freeform & Marvel had said. To soften the blow, they finally gave us some more footage. I am really curious about how much gravitas all this stuff coming out after Infinity War & before Avengers 4 is gonna hold. We've got 2 movies* & at LEAST 3 shows** (possibly up to 7***) coming out between those two goalposts. 4 weeks until Black Panther. 7 weeks until Jessica Jones s2. 15 weeks until Infinity War. Hey, wanna see Carol Danvers break a man's hand? That's right, Captain Marvel is filming! No, you're not hallucinating, that suit IS green & black. 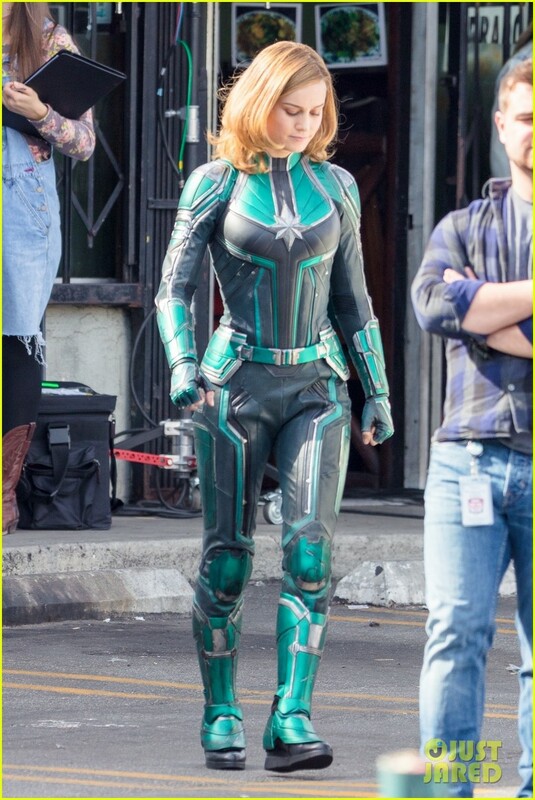 It's a Kree military uniform (& Mar-Vell's original colors); Carol will probably get her red & blue later in the film. Structurally, I like this costume. Other than the gauntlets & boots, it's very realistic for a combat jumpsuit, which an Air Force pilot like Carol would be used to wearing. Beholden unto ye: The trailer for Ant-Man & the Wasp! The film will be set one year after Civil War, so...basically at the same time as Ragnarok. Tomorrow, "Agents of SHIELD" concludes its first arc of the season before taking the rest of February off for the Olympics. It will resume in March, just before season 2 of "Jessica Jones" comes out. It's also just 2 weeks until Black Panther, which is setting records for advance ticket sales. Fortunately, I have Presidents' Day off, so I can wait to see it then. I'm just pumped for next week when the Black Panther soundtrack drops. Guy, Black Panther was off the chaaaaaaaaaaaaaaain! What are your thoughts? Panny, how about that soundtrack? "SHIELD" is back next week. "Jessica Jones", the week after. We're 10 weeks away from Infinity War. I just got home from the theater and I'll post thoughts on everything (including that soundtrack) when it's not 1:30 a.m. I'm annoyed by the SHIELD Helicarrier. It's dumb and it always has been. Is it a Newton's third law issue that bothers you? Not really. It's just a fundamentally dumb idea to me. An aircraft carrier that turns into an aircraft. 'Hey guys, this capital ship we've got here, it's pretty sick, right? But you know what'd be even more rad? If we made it able to fly.' Combining the maneuverability and elegance of a gigantic boat with a helicopter's ability to fall out of the sky and crash, killing everybody onboard. It's stupid. It's the kind of thing you'd expect to see in 'Axe Cop', not in a comic/movie franchise ostensibly written by adults.